Pointing Up: Shout it Out! Shout it out, It's Friday!!! I got some shout outs for some of my favorite things, people, and anything else on my "loving it" list in life. So last night I went to the first of many (I hope) craft nights with some friends. It was so much fun. I forget how energizing crafting is for me. I always walk away feeling refreshed with new sparks of inspiration on my mind. So if you feel like you are in a rut in the creativity department, craft! Paint! Doodle! You may be thinking, "Well if I don't have any creative ideas to craft with how will crafting build my creativity, silly?" Just try it and see for yourself (and then tell me about it of course :D) Picture will be coming soon. 1. See that super cute print that I purchased a loooong time ago but just got the perfect frame for so I could hang it? Yep, that one up there. Well it is from Pen and Paint and I just adore it. This is hanging right over my desk and I love looking at it. So fun & creative. It is sure to inspire me in my dullest of moments. I love all of Pen and Paint's art. 3. Speaking of songs and lyrics... a friend of mine, Brian Nhira, just released a new song called Hope. Not only does Brian have an awesome voice, but this song is incredible. Speaking of powerful lyrics, this is one of those songs that will make you fall in love with Jesus all over again. Give it a listen! 4. Tuesdays I get the opportunity to show off some of my sponsors by letting them guest post, and this last Tuesday was no different. Claudia from Lashes and Beard posted a great message about letting everything we do, no matter how great or small, give glory to God. If you didn't get the chance to read her post I really encourage you to do so. 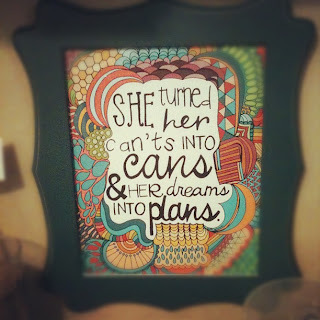 ----> check out her guest post here I know it definitely challenged me and my way of thinking. Be sure to go by and chat it up with Claudia, she is such a lovely lady. 5. 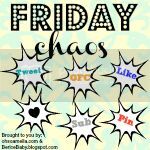 Linking up today with Oh So Amelia and Bernice Baby for Friday Chaos! I love this link up! Come link up and join in all the fun. I am also linking up with Lala Lists with her "In My Opinion" link up. Fun stuff right? 6. My last shout out shall be the same as the first... It's Friday! Enjoy your weekend! Oh my goodness, I saw that print and immediately thought, "I HAVE to have that!" I'm so excited to check out their shop. Hi! I'm your newest follower on GFC and wanted to say hello!